As we all know that IELTS is a system that is made to evaluate your language skills in 4 aspects i.e. reading, writing, speaking and listening. This helps to test your command over the language and know your shortcomings in various modules and perhaps leads to a better perspective of knowing a language and developing it to a required level. Preparing for IELTS Speaking Part 2 i.e cue card is not easy and not difficult either as it depends on individuals how they respond to it. Many people are seen saying that they have a problem with one or the other sections while rest don’t feel the same. So it is all an individual centric viewpoint. Some find speaking easy while others can consider it a nightmare. Well, in our view speaking is a little tougher than the rest as it is something that you have to present and think at the same time which makes a person nervous. It is further divided into 3 sections the first being an introduction followed by the one we are talking about here i.e cue cards and then follow up questions in the last section. Talking about our students, they usually find the IELTS Speaking Part 2 or the cue card the most difficult of all the three but it may differ for different people. Many students go through the difficulty of practicing for cue cards and start thinking how to make it easier for them so that they can speak fluently. Attending IELTS coaching classes in Ludhiana and practicing there is an all together another scenario but a self- assessment and hardwork is required to excel in the same. 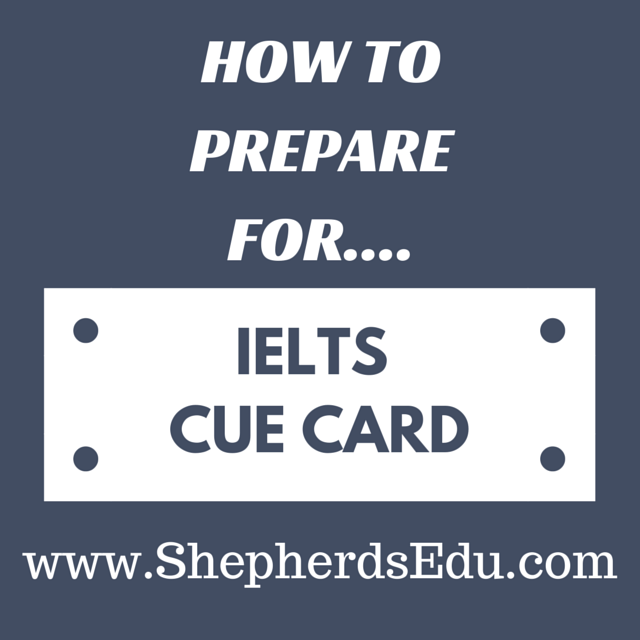 So we came up with some ways or guidelines that can help to perform better in the cue card or IELTS Speaking Part 2. Firstly, you have to work out on your weak areas as in which area you lack may be speaking fluently can be the main aspect. If this is a problem then you should forget about the cue card temporarily. Try to speak in English as much as you can with your family members and friends. Tell them to interrupt you wherever required. This will help in developing a free-flow delivery and you will be in a habit of speaking English as you were not earlier. So in this way you will overcome one main problem in speaking. Moving forward, there comes another problem of not speaking at all .this is due to hesitation or not being in touch with the language for a long time. This is also a solvable issue .you just have to stand in front of the mirror and talk to yourself. Speak about anything you want to and keep trying hard to improve. After few days of practice you will see that your hesitation is vanishing. And you will find it easier to communicate well. Another problem that is faced is lack of content that is an issue many face. It is something like you go blank all together and sometimes it is like you know what to speak but cannot put it into words. This is the most difficult situation because sometimes you feel quite disturbed because you think you can but you still cannot. But hold on, this issue can also be solved easily. What all you have to do is a little hard-work blended with patience. When you see a cue card start creating few points in your head. Don’t think of anything extraordinary to create an impression start with something very basic that could help you in moving further easily. This will trigger your thinking area of the brain and eventually it will start generating nice ideas. Than you can notice that speaking over a cue card was never so difficult. Another method can be you draw an imaginary circle in your head an think what it can be related to. In this manner you will be collecting some data points and this will bring wonders. Next comes the tone and voice clarity. The tone should be calm and composed and full of expressions as if you are explaining something & the clarity of the words should be good enough , so that even if you use simple range of words , they still create a good impression on the invigilator. Body language and facial expressions should also be in a controlled order so that you avoid overdoing anything. We guess all these tips or guidelines will serve you in a better way and you will be able to clear your doubts.